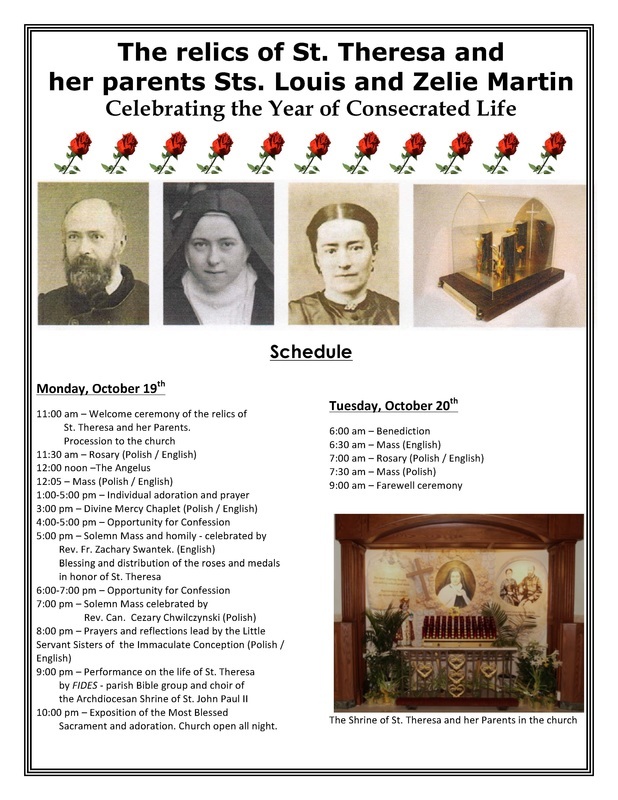 Relic Tour - 2015 Year of Consecrated life: rejoice! 2015 Year of Consecrated life: rejoice! ﻿Scroll to bottom of page for schedules and locations of the tour. The relics of St. Therese have been on an international pilgrimage since 1994. A deep atmosphere of prayer and reports of many graces have surrounded them. Louis and Zelie also have "traveling relics" which are on pilgrimage; right now they are in Madagascar. Read about the transforming effect of a single visit of the relics of the Martin spouses to Sainte-Therese Church in Metz, France. Louis and Zelie and St. Therese come to meet you where you are. We are truly blessed to have this reliquary on tour here in the Archdiocese of Newark. 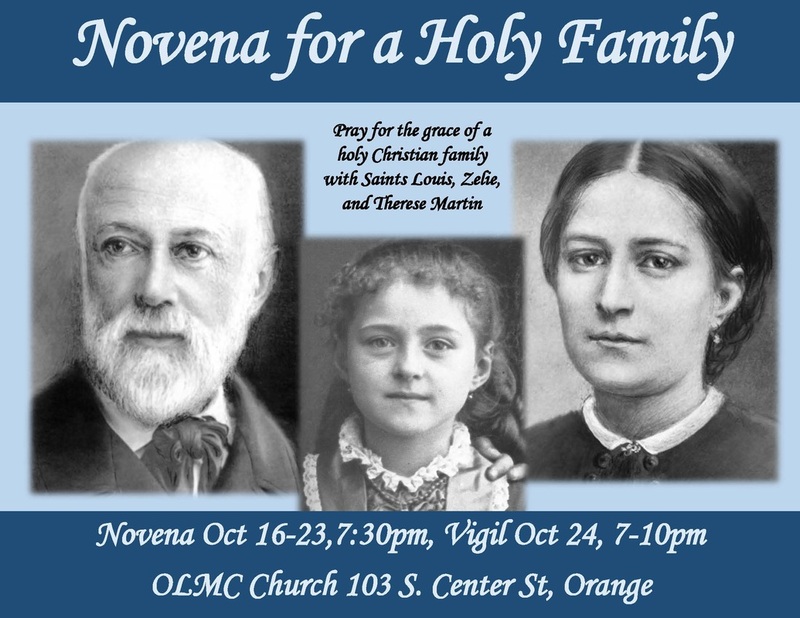 Please take advantage of this rare chance to pray in the presence of the relics. The reliquary, created by French sculptor Fleur Nabert, contains significant relics of Saint Therese, the gift of the Lisieux Carmel, and of Blessed Louis and Zelie Martin, the gift of the former rector of the Shrine at Lisieux, Mgr Bernard Lagoutte, who accompanied the reliquary when it was entrusted to Philadelphia at the Magnificat Day of Faith in November 2013. The relics of each saint are in a separate pillar, which together form an ensemble. In front of the relics of St. Therese stands a rose; in front of the relics of Louis and of Zelie, a lily. 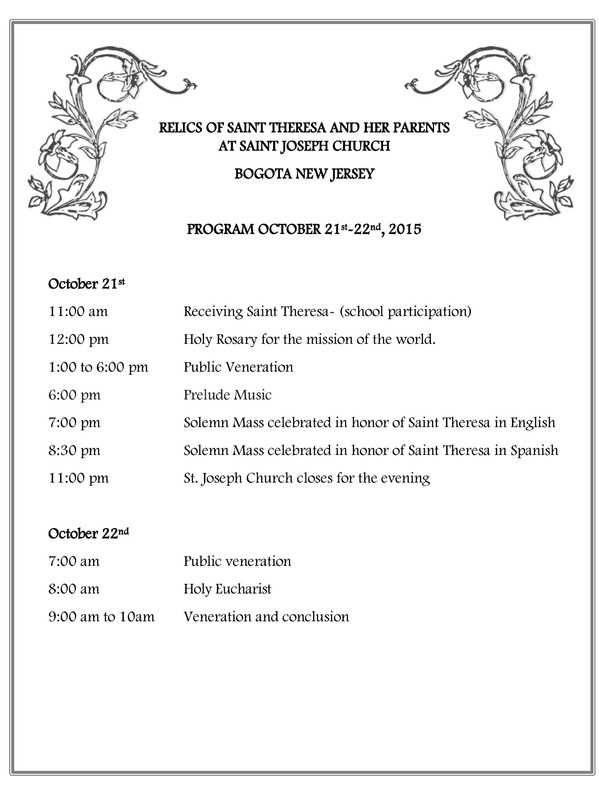 In addition to many local and individual initiatives, the Archdiocese of Newark invites all priests, religious and lay-faithful to come together on October 17, 2015 in the Cathedral Basilica of the Sacred Heart for a special day of celebration around the relics of St. Therese of the Child Jesus and her parents, Blessed Louis and Zelie Martin. After the celebration in the Cathedral, the relics will travel through the Archdiocese. For more information on the relic tour: Click here. 9:00 a.m. Talk by Rev. Frederick L. Miller, S.T.D. 2:00 p.m. Talk by Most Reverend Bernard A. Hebda, D.D. J.C.L., J.D. In order to host properly the relics of the Martin family, the Magnificat Foundation commissioned the renowned French artist Fleur Nabert, sculptor of sacred art, to create the first “family” reliquary for veneration and procession. On a pedestal of bronze are placed three individual reliquaries, each marked by the first letter of the names Thérèse, Louis and Azélie. The reliquary of Saint Therese, Doctor of the Church, is placed in the center, the highest of the three, while those of her parents are united by wedding rings to remind us of the power and sanctity of the sacrament of marriage. Inspired by a drawing of Saint Thérèse, her parents are represented by two lilies. The flower of Zélie Martin is slightly smaller, a sign of her death during Therese’s childhood. The flowers are molded in bronze with gilded leaves of yellow and white gold. Therese, the "Little Flower", is represented by a rose, for she hoped to “scatter herself” beneath the footsteps of Christ, and promised “I will spend my Heaven doing good on Earth. I will let fall a shower of roses”. The ensemble is built around a radiant cross, cast in bronze, alluding to the attachment of each of the Martins to Christ. The ensemble is protected by a transparent domed cover to remind us that the Christian family is a domestic Church, the first place where we practice sanctity.